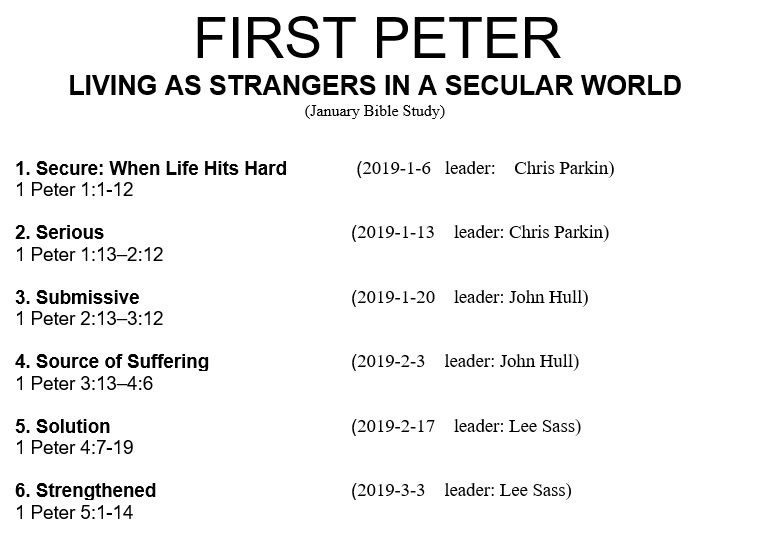 Our winter Bible study focused on the book of 1 Peter, entitled “Living As Strangers in a Secular World”, has finished. But be not dismayed! Video and (when available) study guides from each session are still available below. Take time to enjoy (or recall, for those who attended) this church-wide study that was such a spiritual challenge, but also an encouragement! An ongoing weekly Bible study is being held each Wednesday evening from 6:45-8:00 PM. Don’t miss out on this opportunity to better know God’s Word. The learning, fellowship, and discussion are sure to allow “iron to sharpen iron” (Proverbs 27:17)!